It is always nice to be welcomed and recognized! 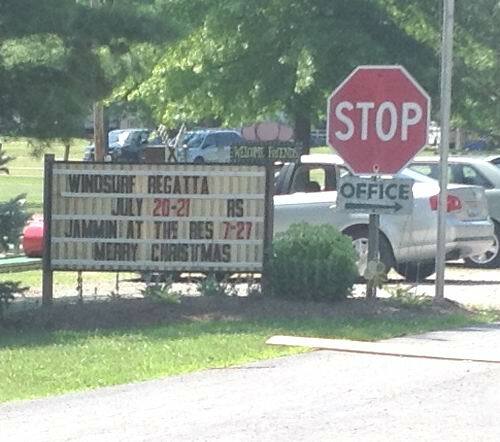 Many thanks to the New London Reservoir Campground and Recreation division for providing a great windsurfing venue and furnishing windsurfing trophies again! We had awesome Friday pre-event fun sailing with 6.5 short board conditions that brought out several locals and enticed several racers to show up a day early. It blew all day long, even after dark and most were half spent before the racing was to begin on Saturday. Late Friday evening people gathered round a camp fire watching a huge lightning show far off in the distance over Lake Erie. That huge front hit camp about 3am in the morning with wind and rain until near eleven Saturday morning. Unfortunately that weather kept several regular attenders at home. Still we had ten survivors that registered plus several non-competitors, along with spouses and a dozen or more kids and four dogs for a nice sized group. Racing got going about 12:30 Sat in 5 to 10 mph breezes in partly sunny skies. Many thanks to Carl Rappaport who organized food for Saturday lunch and an evening group barbeque and Sunday breakfast. The course laid out by Eric Rahenfueher this year took advantage of near every square foot of water on the 220 acre reservoir. 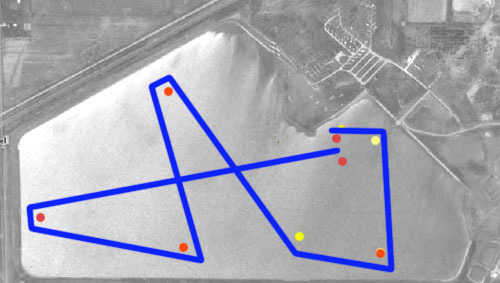 The upwind mark was the mysterious Research buoy followed by 4 jibe marks and a final leeward mark and tack to a short finish gate right in front of the beach. Spectators watched the action from the new gazebo located at the end of windsurf pointe seen in the picture below. There were lots of close finishes which made it fun for beach spectators to cheer on their favorite windsurfer to victory. Also new this year were two water front large primitive cabins and two camp sites with electric on the water on the west side of windsurf pointe. 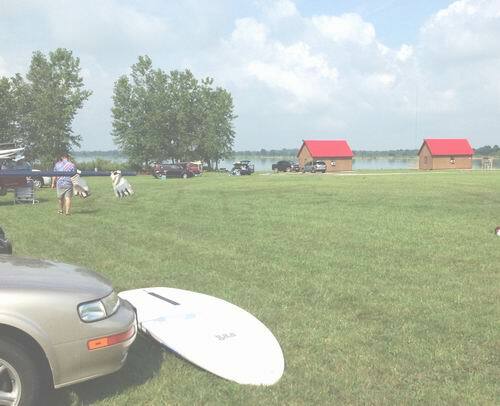 The improvements make the New London Reservoir a very affordable family windsurf vacation destination for Ohio area windsurfers. Four long races were ran on Saturday. Sunday morning the wind was very light with long lulls and the race committee called racing officially over about 12:30. Some very nice windsurfing trophies were awarded.